On this freezing cold day we welcomed Mounts Bay Academy to Hugh Sexey's for the round 5 of the National Cup. Mounts Bay Academy is from Penzance in Cornwall. It was a long journey down the M5 for them '3 Hours drive' their teacher said. 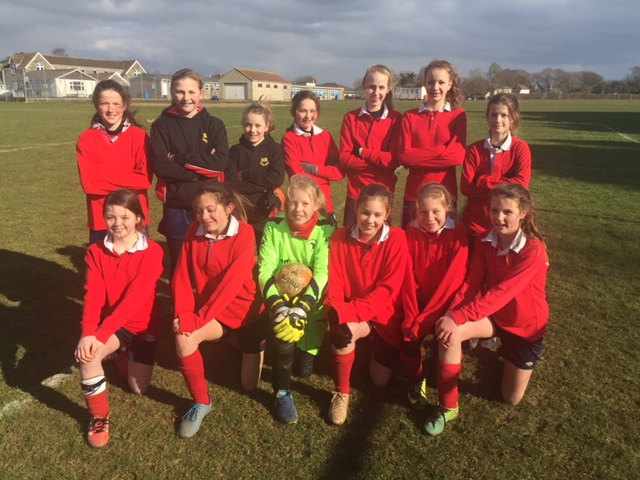 The biggest challenge for both girls teams was to get used to the cold, it was freezing with a strong blustery wind blowing everywhere across the pitch. In fact, a fantastic warm up led by skipper Phillipa Griffiths played a big part in winning the game, her warm up which she put together the night before was dynamic and aerobic which kept the girls warm. The first half, especially the first 20 minutes, was close with both teams playing great attacking football. Mounts Bay number 12 was causing problems with her fantastic ability. Millie Pargeter was moved and given the task of man marking her, closing her down and stopping her putting us under any more pressure. Millie was brilliant at doing this - number 12 couldn't cope without the space; well done Millie. Jemima Thurling - our goal machine- smashed home the first goal, (her 21st goal of the season) after great work from our midfield in setting up the goal. Half time approached and a good constructive team talk came up with a constructive game plan: to up the tempo and get another early goal, as Mounts Bay now had the wind in their favour. Shortly later Jemima Thurling bagged her 2nd goal of the game; she used her physical presence and timed her shot perfectly, booting the ball into the top corner and giving their keeper no chance: 2-0 to Hugh Sexey's. Mounts Bay had some chances, but our goal keeper Edie Pargeter saved some great shots from them. This was Edie's best display between the posts all season; she had a cracking game and was full of confidence. There were more goals from Millie Pargeter- scoring from 18 yards by smashing the ball into the roof of the net, and Katie Radford. Katie kept the pressure on the defence and went round the goal keeper to slot the ball home, making the score 4-0 to Hugh Sexey's. Then a few minutes later Thurling bagged her hat trick, scoring her 23rd goal of the season! Credit must go to Mariella Kennedy for coming off the bench and immediately making an impact with her strength, especially in her tackles to win the ball. Our back 3 defenders were Evie Catley-Day, who improves game by game, Freya Stephens and Ella Woodcock, both of whom defended superbly and protected goal keeper Edie. Midfield consisted of Jessie Woodcock, Philippa Griffiths and Lowenna Jackson-Voyzey who worked their socks off all afternoon, running from box to box and producing some great football.. Strikers Libby Slater and Jemima Thurling proved to be a dream striker partnership; both girls are on fantastic goal scoring form at present. Youngster Cerys Webb proving to be a real talent - Cerys can play in absolutely any position which is every manager's dream. Player of the match was very difficult to chose, but the players awarded it to Edie for her fantastic goal keeping display; without Edie it's possible we may not have won this game. A truly a great of football from both teams,and a real pleasure to referee.